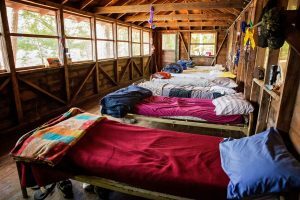 Sleepaway Camps with Cabins – What’s the Big Deal, Anyway? 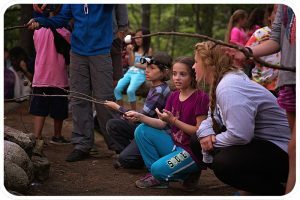 Sleepaway camps with cabins? With tents? A yurt? What’s the difference? Here at Quinebarge, our campers, CITs, and staff sleep in cozy, “rustic but clean” cabins. Each cabin has screen windows, curtains, comfortable bunk beds, electricity and cubbies for storage. Girls and Junior cabins include a bathroom; boys use our wash house and shower house. Group Bonding – Most tents sleep 2 or 4 people, at most. With up to 8 campers per cabin, we maintain a small camper-to-staff ratio, while allowing campers to bond in groups. In each cabin, everyone is a member of a little family within our greater Quinebarge community. Supervision – In all of our cabins, there are at least two counselors to look over campers. These counselors sleep in the cabin, bond with their campers, and keep a close eye on their wellbeing. That may mean helping younger children with personal hygiene, confronting homesickness, or simply being a cool, friendly role model for teens. Sense of Security – Many campers, especially younger ones, haven’t spent much time in the woods. Nighttime sounds can be scary! Having solid walls around you, instead of a nylon tent, helps campers feel safe and secure in a new environment. Protection from the Elements (and Bugs!) – At Quinebarge, you don’t have to worry about your tent bottom leaking, mosquitoes getting through the zipper door, or your tent mate tracking mud onto your sleeping bag. Our cabins are a home away from home, with basic amenities you won’t find in a tent. A Better Night’s Sleep – Sleeping on the ground is simply not comfortable, and kids need to rest after playing all day. Our bunk beds and mattresses are super comfy, and allow everyone to get the sleep they need. Just because we prefer cozy cabins and comfy beds, doesn’t mean that we don’t supply ample opportunities for campers to, well, camp! We offer both offsite overnight trips and onsite cabin camp-outs in Monkeytown or in our camping area. Overnight trips range from tenting at campsites or state parks, to using AMC huts while hiking in the White Mountains. Cabins groups camp onsite, spending time telling stories, stargazing, and roasting marshmallows before turning in for the night. It’s a fun, low-stress introduction to camping for first-timers. 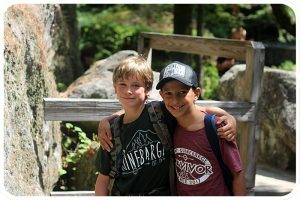 Here at Camp Quinebarge, everything we do boils down to facilitating fun and friendship for our campers. We maintain a camper-to-staff ratio of 3:1, enabling us to know each camper. Our dedicated staff ensure their time at Quinebarge is something they’ll look back upon fondly in years to come. 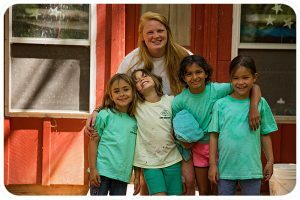 With camper’s choice activities, cabin experiences, and the welcoming nature of our Quinebarge family, your child is guaranteed to love it here. Join us this summer and experience all Quinebarge has to offer for yourself!